Mentioned in the book 'London County Council Record of Service in the Great War" pg.92 - Tramways Dept. Son of John Charles and Emma Amelia Paine. Remembered with honour Lewisham (Ladywell) Cemetery. Grave Ref. Screen Wall. D. 3175. 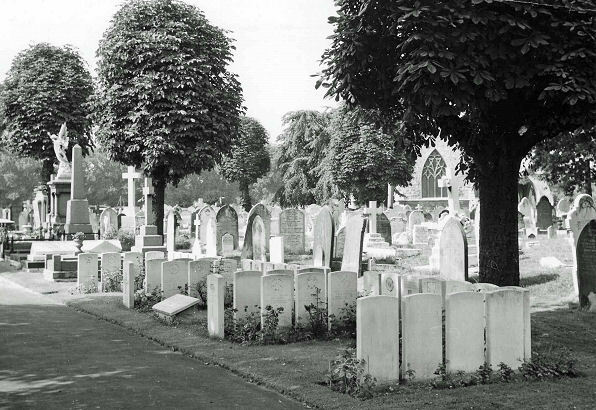 The cemetery entrance is located at the corner of Ivy Road and Brockley Grove. It is immediately east of Deptford (Brockley) Cemetery, however there is no clearly defined boundary between the two sites. There are around 100 burials in the War Plot and their names are inscribed on a Screen Wall Memorial located in Plot D which also commemorates those whose graves are located elsewhere in the cemetery but are not marked by headstones. In addition to the scattered graves in the cemetery there are 46 headstones in the Commission's Commemorative Plot, located in Plot B.